Sometimes my customers need to be able to get a direct link to a record in their APEX application which they can share with others (e.g. to publish it on a website, or send by email to a colleague). They don’t want people to be able to easily “guess” the link (so it needs to have some degree of randomness and complexity), but it’s not so sensitive that if someone somehow gets the link by mistake it won’t be cause for alarm. They would like to be able to invalidate the link at any time, so if they send the link and then decide they don’t want people viewing the record anymore, they can mark it as “expired”. Note that the random string is more than likely to be unique for each record; but we prepend the unique ID as well which guarantees it to be unique. In addition, if a user sends us a link saying “this didn’t work”, we can visually parse it to see what the record ID was they were trying to access. This is needed because our design allows users to overwrite link_code (e.g. to expire the link). Create a page (in my example, this will be page 100) to be the link resolver. It won’t have any complex regions or show any information, but will merely redirect the user to the page with the actual data (page 10, in my example). Note: if the target page that shows the record is Public (i.e. the people getting the link cannot login to the application), this link resolver page will also need to be public – i.e. set Authentication to Page Is Public. On the other hand, if the target record is only available to authenticated users, the link resolver page should be restricted to authenticated users as well. If the page gets a valid value for P100_REF, it will find the ID for the corresponding record and redirect the user to the page showing that record. If the link is invalid or expired, the page will not redirect but will show a “record not found” message. We show the generated link on a page with an ordinary Text item. We need to generate the link using the page’s domain name, which (at least in some cases) we don’t know ahead of time. To do this, we need to get the page’s URL including host, port and path. Create a dynamic action on page load. Set its condition so it only fires if P10_LINK_CODE is not null (if it doesn’t already exist, create P10_LINK_CODE as a hidden item based on the database column LINK_CODE). This dynamic action constructs the link using the current window’s URL including path (which includes the trailing “/apex/f” or “/ords/f“) and query string (“?p=...“). When the user clicks the item, we want it to automatically select the entire link and copy it to their clipboard. To show this has happened, we show the word “Copied” on the screen. Users who are looking at the record get a “Share Link” in a convenient item that they can copy-and-paste into emails or web pages. If you need to expire a link, simple update the record with a new link_code and the old links will no longer work. I wanted to use the “Cards” report template for a small report which lists file attachments. When the user clicks on one of the cards, the file should download and open in a new tab/window. Unfortunately, the Cards report template does not include a placeholder for extra attributes for the anchor tag, so it won’t let me add “target=_blank” like I would normally. One solution is to edit the Cards template to add the extra placeholder; however, this means breaking the subscription from the universal theme. Note: this code affects all cards in the chosen report. A common APEX project is to take a customer’s existing spreadsheet-based solution and convert it more-or-less as is into APEX. I’ve got one going at the moment, a budgeting solution where users need to enter their budget requests. They currently enter their requests into an XLS template file which generates subtotals and totals for them. To do this in APEX I’m going to use a tabular form, and to do the subtotals I’ll use jQuery in a way not too dissimilar to that I described earlier. There are column totals that need to be added up and updated dynamically (indicated by the green arrows) as well as subtotals within each row (indicated by the red arrows). I started by looking at the generated items, getting their ids (e.g. 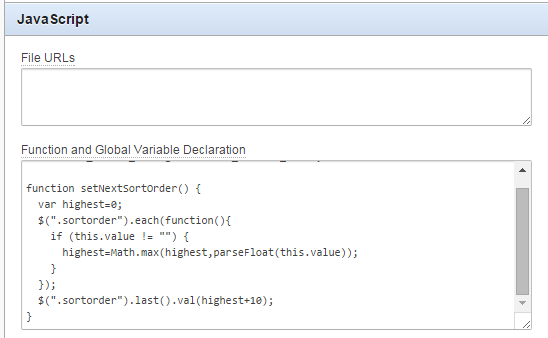 “f09_0001” etc) and writing the jQuery code to detect changes, add them up, and put the totals in the relevant items. I then started repeating this code for each column, and thought “hmmm”. I was aware of another form that I would need to build, with a similar structure except that there will be two sets of “Jan-Jun” + “Jul-Dec” columns, each with their own subtotal. Create the tabular form as usual (mine is based on an APEX Collection) and remove the standard DML processes, replaced with my own that calls APEX_COLLECTION instead. Create a standard report that generates the total items by calling APEX_ITEM.text, with p_attributes=>'data-total="x"' (with a different “x” for each column, e.g. year1). 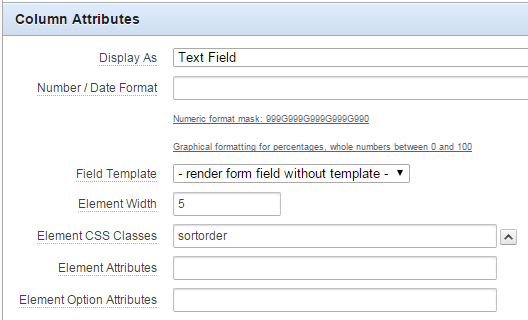 Set the Static ID on the tabular form region (e.g. tabularform). Set Element Attributes on the Jan-Jun column to data-cell="year1" data-col="year1_jan_jun", similarly for the Jul_Dec column. Set Element Attributes on all the Year columns in the tabular form to data-col="yearx", where x is 1..5. Set Element Attributes on the total for the first year to data-subtotal="year1". So, to summarise: all the data-cell items get totalled to the data-subtotal item in the same row; and all the data-col items get totalled to the data-total item below the tabular form. // the items to add up are identified by data-cell="x"
// the item to show the total is identified by data-subtotal="x"
In case you’re wondering, I’m re-using the formatMoney function here. There’s a number of things happening here. On page load, we add a listener for changes to any input item that has a data-cell attribute; this calls updateSubTotal, which detects the row number for the triggering item, adds up all the values for any input item that has the same data-cell value; and puts the total in the input item with a matching data-subtotal attribute. We also have a listener for changes to any item with a data-col class; when these are changed, updateTotal adds up any item with the same attribute, and puts the total in an item with attribute data-total. The jQuery selector [id$='_"+rn+"'] makes sure that the row-level code only finds items ending with the given row number (i.e. '*_0001'). The benefit of this declarative approach is that it is much easier to re-use and adapt. EDIT: fixed the change trigger so that I don’t need to call updateTotal from updateSubTotal. This makes the items appear uppercase, but when the page is posted it actually sends the values exactly as the user typed. They’d type in “lower“, it looks like “LOWER” on screen, but gets posted as “lower“. In many cases I could just convert the value in my PL/SQL code, but in cases where I was using Apex tabular forms, I don’t know a simple way to intercept the values before the insert occurs. I have a simple tabular form with a numeric “sort order” column. I want the value of this column to be defaulted automatically, based on the maximum value of the rest of the records on the screen. Unfortunately the builtin Apex default type for columns in a tabular form can only be based on an Item, or a PL/SQL expression or function. I didn’t want to make a database call to get the maximum value because the user may have added multiple records which have not yet been saved to the database. 1. Add a class to the tabular form column by setting the Element CSS Classes column attribute (I’ve used “sortorder” as the class name). It’s a bit hackish and might not work correctly in some cases but it’ll do for now. If no checkboxes are selected, the report shows all transactions by default, except for Closed or Deleted transactions. This searches for all label nodes where the “for” attribute contains my item name (“P23_FTS_STATUS”), where the text contains a “*”. It then adds the “title” attribute with my desired value. Don’t you hate those nagging issues where you attempt a few fixes in vain, waste hours of your life, and then suddenly the issue just resolves itself? What’s worse than an issue that won’t go away is one that just resolves itself and you don’t know why. You don’t know if it is just hiding, waiting to reappear at some inconvenient time later (e.g. when the app goes live in Production). I added the first modal popup on a page in my application running on APEX 4.2.4 and immediately hit the problem described here: Jquery modal causing page protection violation error. I’d used the simple popup modal using the builtin jQuery dialog widget as described here: Oracle APEX 4.2 – Creating a modal window [link no longer valid – http://rowantraining.blogspot.com.au/2013/08/oracle-apex-42-creating-modal-window.html] – Helen’s example works but doesn’t include submitting the page. Side note: I found it only worked if I put it in one of the page body regions, not in the After Header region. If I turn off session state protection on the item, the same error is then raised on the next item on the page. Plus, I require session state protection to be enabled so disabling it is not an acceptable solution. This workaround seemed to have done the trick, but I wasn’t happy – it just felt “hacky”. I tried adding a similar popup to another page that was far simpler and it didn’t experience the problem. So submitting from a popup dialog should work. I reverted the code to remove the timout and tried disabling all the Dynamic Actions on the original page, and the problem disappeared. So I figured the problem was caused by some interaction with a Dynamic Action. I gradually re-enabled the DAs one by one, retesting the page between each one. Finally I re-enabled the last Dynamic Action – and the problem still didn’t reoccur. So the problem has resolved itself, but apparently not because of any particular thing I’ve fixed, and I can no longer reproduce the problem. Aarrgh. After a number of unrelated changes to the page, I started getting this error again, consistently. As the comments (see below) suggested, this is due to the jQuery dialog.close() method moving its contents outside of the <form> tag, which meant that the items submitted to APEX differed from those in the original page, causing APEX to raise the error. I could find no way of avoiding the error, so instead I’ve fixed it by a little hack: instead of opening the dialog based on the original region that was generated by APEX, I use jQuery to create a copy of the region, and open and close that copy. That way, the original region stays unmodified (forever hidden) and the page submit works. It’s a bit fiddly but it seems to work so far. Get it? “an item with many hats”… yeah ok. If the label needs to change based on another item, I could set the label with the value of another item, e.g. “&P1_CONTACT_NUMBER_LABEL.” and when the page is refreshed it would pick up the new label. But at runtime, if the label needs to change dynamically in response to changes in other items, we need to do something else. Caveat: The need for changing the label should be very rare – it’s bad practice to overload one field with multiple meanings. But if you must, this is what you can do.